a BOY!!!! 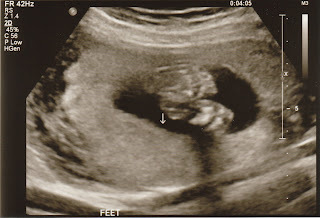 Baby Henry Morgan Kavanaugh is expected sometime around March 20, 2011! 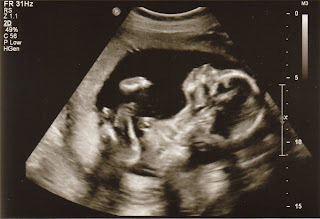 The ultrasound was one of the best moments of my life! It was seriously amazing. 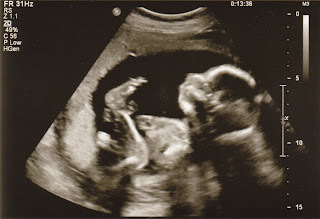 Morgan and my Mom both came with to the ultrasound, and we got to see every little part of baby Henry. 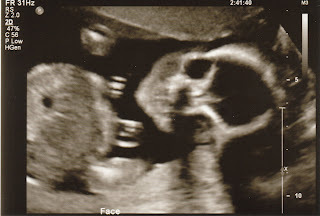 The ultrasound tech started at his head and worked his way down, which made for a tense 20 min until the gender was revealed. But it was still pretty awesome. First, we got to see all four sections of his brain. Then his face and lips (they were checking to make sure he doesn't have a cleft lip). Then we took a look at his heart. It was crazy how much detail we were able to see. We saw it beating at the 9 week ultrasound, but this time we were able to see all four chambers as the blood was pumping through. Then we checked the umbilical cord connection, and the placenta. Then the tech checked his spine and back. Then we checked his legs and little feet - and I'm happy to report that he had 10 toes! Finally, it came to the moment to reveal the gender! I swear my heart stopped. But as soon as the tech showed us between his legs it was pretty obvious he all BOY! After that, the tech took a bunch more measurements of his arms and hands, but honestly I was in a total blur after learning I was having a son. Overall Henry was totally perfect! All the measurements were perfect, and he is totally healthy. He is measuring about 9 days ahead of his due date (so just over 21 weeks) and he was 13 oz. Our regular doctor might move up his due date when we see her in a couple weeks, or we might just be having a big baby. We did have one scary moment when the tech said "And he has four fingers..." Morgan and my hearts immediately sank. But then she continued "...right next to his thumb." Whew! I guess she was medically correct, but way to scare the crap out of two parents! Henry was once again very active during the ultrasound. Once the tech was done getting the measurements, we had a few min before the doctor came into go over the results. During that time, the tech took all sorts of cute pictures of his profile, and we just watched him hanging out. He was super busy stretching his back and neck, which was super funny. He was also moving his feet and hands all over the place. Overall it was an incredible experience. Today I have hit another milestone. I am officially 20 weeks (5 months) today. This is the half-way point of the pregnancy. At this point, I'm feeling really good. I'm just busy gaining weight, and enjoying all the kicks, jabs, and rolls I feel from Henry. I'm also starting to fight the urge to buy every baby outfit, toy, and product out there. Henry was stretching in this picture. He was moving his head super far back, and his feet where pointing up and moving all around. So cute! Baby Feet - all 10 toes! This is Henry's face, very ready for Halloween, but still adorable. I like that you can see all his little fingers.